I will be posting some recipes that I made for my daughter's graduation party. The delicious marinara sauce in the above photo is from Planner Perfect Meals. I used penne for the pasta, keeping it warm by turning a slow cooker into a double boiler. I put about an inch to an inch and a half of water in the bottom of the slow cooker and set a foil pan inside to hold the pasta. My pan was too large to fit all the way inside, so I covered it with foil instead of the slow cooker lid. I kept the temperature on high the entire time, but I probably would have turned it to low if I had a pan that fit. I would recommend finding a pan that fits and raising it from the bottom of the crockpot by using foil balls or a shallow heat-safe container. I tossed the cooked pasta in a little olive oil to keep it from drying out. 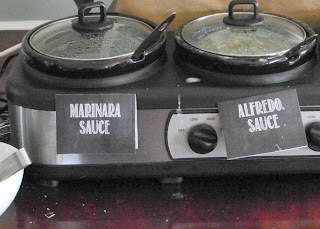 Below is the alfredo sauce recipe I made for the party. Whisk egg yolks and half & half in a small bowl. Melt butter on medium heat, add garlic, and cook until fragrant (a minute or two). Whisk in arrowroot, flour or cornstarch. Whisk in egg yolk/half & half mixture. Heat up a bit. Add cream, salt, pepper, and nutmeg. Heat on medium or medium hight heat until thickened, whisking frequently (constantly as it gets warmer). Don't let it boil. Add parmesan a little at a time, making sure it is melted in thoroughly. Egg yolks may be omitted, but they add to the creamy texture. You could use all half & half or a mix of cream and whole milk or half & half and whole milk. Just make sure you use something with fat or it will take forever to thicken. Can be made ahead of time and refrigerated. Will probably last up to 5 days in refrigerator. I think it would freeze well as long as you whisk it really well when reheating and reheat it slowly. Don't let it boil.